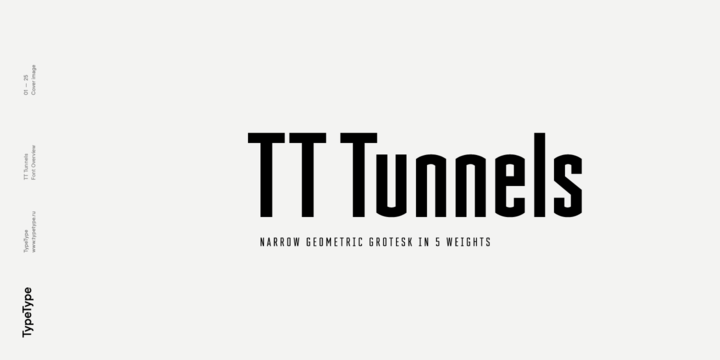 TT Tunnels is a sans serif typeface created by Vika Usmanova together with PhillipNurullin, TypeType Team and published by TypeType which is has minimally necessary range of weights, each typeface is completed with ink trap, a large number of OpenType features and more than 70 languages support. This narrow geometric grotesk font is perfect for branding, magazine, logo, packaging, text, web and so on. Have fun! A font description published on Tuesday, December 19th, 2017 in Fonts, PhillipNurullin, TypeType, TypeType Team, Vika Usmanova by Alexandra that has 2,047 views.